Doubtless, every photographer has a list of artists who have been a major influence on them. Usually, though, that influence has been through photographs, or through writing on technique (like Ansel Adams's series of books The Camera, The Negative, and The Print—which belong in every photographer's library). Sometimes, though, the influence comes along a different path. One of the artists whose work has had a major impact on my photography and how I think about it has been Ted Orland. Orland is a former assistant to Ansel Adams (side note: am I the only photographer who feels like they're the only photographer living who wasn't an assistant to Adams? ), and of course he's an excellent photographer. However, it's his straightforward, pragmatic writing on the non-technical process of making art that have had such a huge impact on so many people. I had been thinking pretty hard about photography and art when I came across a book that Orland had co-written with David Bayles, Art and Fear: Observations on the Perils and Rewards of Artmaking. This little book asks (and answers) questions like "Why should we make art?" and "Why is it so hard for artists to continue making art?" When I came across it in 1997 or so, I thought I'd come across one of those happy, synchronistic coincidences—a book that was just right for me came along at the exact moment I was ready for it. Since then, though, I've come to realize that it's a timeless classic—that every artist faces many of the same hurdles, and Bayles and Orland drew on their experience to give us pragmatic, practical ways to not only get started making art we care about but to overcome the hurdles and roadblocks that so often result in our not picking up the camera for months on end. And now, Ted Orland has done it again. 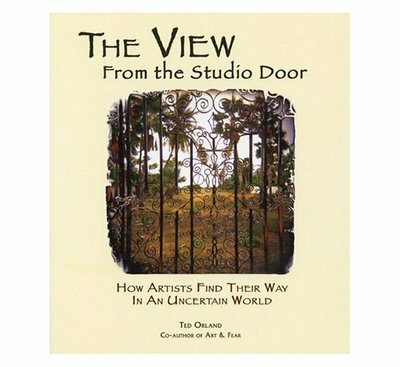 This time, he's written a wonderful gem of a book titled The View From the Studio Door: How Artists Find Their Way in an Uncertain World. Orland doesn't seem to be a guy who shies away from tackling big stuff, and this time he moves on to pondering not only why we make art but what difference our art makes and how it relates to the world around us. Among the questions he tries to answer are "What are we really doing when we make art? Does the artist have a role in today's culture? Where does art fit into the grand scheme of things?" I've had the book for about ten days now, and I've read it through twice and spent hours cogitating on the issues it raises. If you've already read Art and Fear, I think you'll be delighted if you buy and read The View from the Studio Door. And if you haven't read Art and Fear—why, buy them both. They're sort of a matched set. You can buy them from Amazon , of course, although you'll have to wait a bit to get The View from the Studio Door because Amazon seems to think it's not release until April 15th. Or, you can go to Ted's website and buy an autographed copy, right now. I'd certainly agree that Orland (and Bayles) have a strong idea of what art is. I'm less clear about how their concept of art is tied closely to western values, and if you're saying that they feel that art having monetary value as it's main thrust is a good thing, I guess we took different messages away from these books. In fact, I take almost exactly the opposite away from Art & Fear - I think they're saying that the vast majority of art produced has no monetary value - but that it doesn't matter and there are other compelling reasons why we should (must) continue to make art. Could you expand on your thoughts a bit? It's nice when someone reads something and finds the same message I do, but it's far more interesting to come across views that diverge. Give us more!